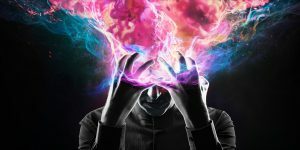 Legion is the critically acclaimed new FX series about Marvel’s, David Haller, a powerful mutant suffering from mental illness. Kyle Willoughby and Claire White are happy to welcome Hypable.com’s, Karen Rought to discuss a superhero show unlike any before it. Kyle begins with Haller’s traumatic backstory, and then takes a closer look at the different portrayals of his “schizophrenia” as compared to its medical definition. Claire describes the creative momentum and approach of showrunner, Noah Hall, and how FOX TV and Marvel Entertainment made the whole thing work. Karen and our hosts conclude with their thoughts on the first season, and what this means for prestige superhero television.